...there wasn't much. Only 13.5 miles of double ribbons of rusty rail; not good enough for ConRail to use, and buried beneath the brush and fallen trees. In 1982, two groups were planning to purchase the track, one for recreational use and the other to continue the freight connection for Titusville industry. 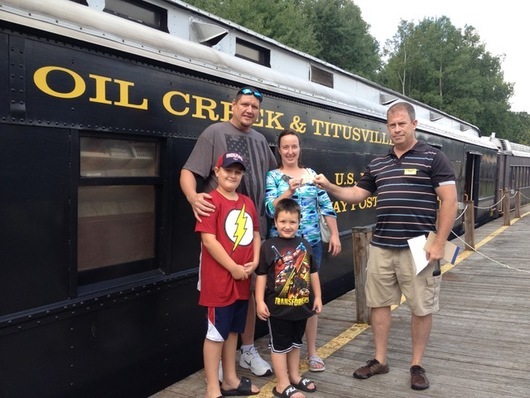 These two groups came together in 1983, to form the Oil Creek Railway Historical Society and purchased the track, buildings and real estate on June 6, 1986. July 18, 1986, saw the inaugural excursion of the OC&T train, utilizing cars leased from several railway historical societies, individuals and museums. 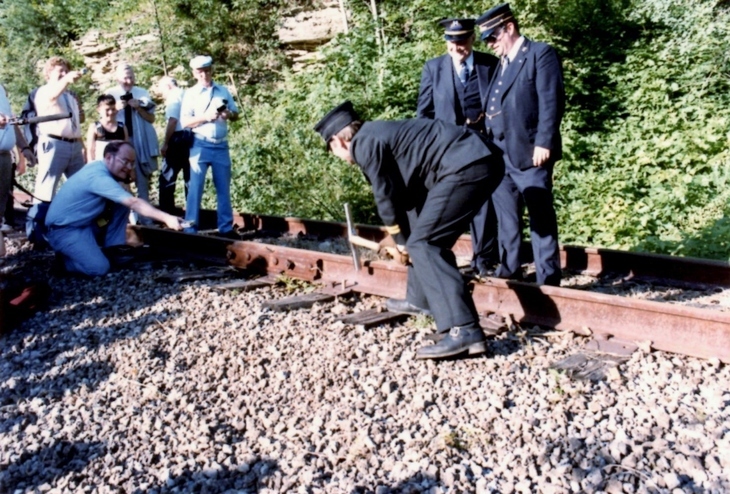 James Stevenson, Vice President of the OCRHS, Lou Adelson, Managing Director of the society, and Donald Francis, Train Conductor, drove the golden spike. That first year saw over 33,950 passengers! During the first winter, seven coaches were purchased and reconditioned. Friends of the Railroad (FORR), the official support group of the society was organized in 1986, with fifty charter members. Proceeds of the membership campaigns are used for projects to benefit the OC&T. During 1987, the stations at Drake Well and Rynd farm were completed. The refurbishing and remodeling of the old Perry Street freight station in Titusville began the first week of November that same year. The station at Petroleum Centre, the headquarters area for Oil Creek State Park, was constructed and opened as a 'flag stop' in 1989. All cars have been completely rewired. Sound systems and ceiling fans have been installed, interiors repainted and seats reupholstered. Today, the OC&T travels 'through the valley that changed the world', having carried over *700,000 passengers. Several Titusville industries rely upon the railroad to move their raw material and products to or from locations throughout the US, Canada and Mexico. *Update: We just honored our 750,000 passenger on Saturday, July 28! Congrats to James Miller & Family who received a Lifetime Rail Pass, our 30th Anniversary Knife, T-shirts among other gifts.